Privacy, it’s important. With all the integration between apps, devices, computers, and the big, bad internet, it’s easy to lose track of all the ways people can find out about you, your friends, and your family. Thankfully, most services and devices these days have some sort of tool or system to allow you the control you need to manage which info is available and to whom, as well as how much is even out there. iOS 6 is no different, with a nice set of toggles to allow you to be the boss of your own information. Tap Settings to bring up the app. The third section in the Settings app has Privacy at the bottom of the area; tap it to hop into the Privacy settings. 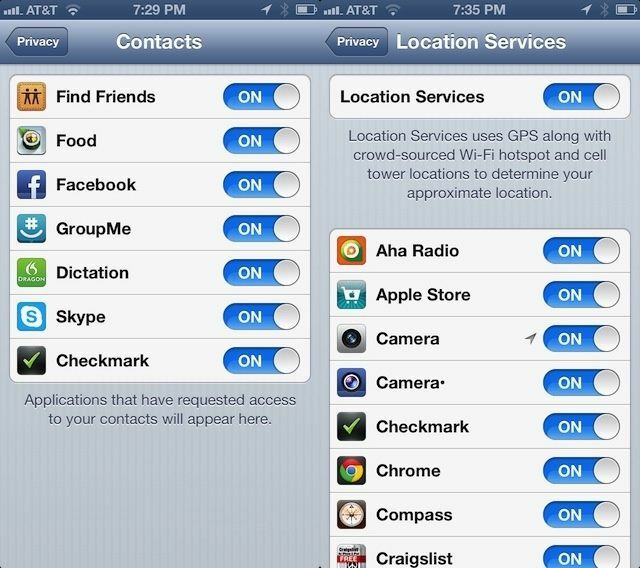 In the Privacy section, you’re able to turn Location Services off or on, as well as which apps can access your location info. If you don’t want your Photos to contain location data, for example, you can toggle Camera to OFF. scroll down to see the entire list of apps you’ve granted rights to use your location data, and toggle to OFF all the ones you don’t want knowing where you are. Backing out to the Privacy panel, again, there’s a list of Apple apps, like Contacts, Calendars, Reminders, and Photos. Tap each one to see what other apps are allowed to access their info. Tapping on Contacts, for example, shows me that Find Friends, Food, Facebook, GroupMe, Dictation, Skype and Checkmark all have access to my Contacts. If I want to restrict any of those apps from my Contacts info, I can toggle that off here. Twitter and Facebook have a similar interface. Tap on the Twitter button in the Privacy section and toggle to OFF all the apps you don’t want to have access to Twitter. You can do the same with Facebook. Keep in mind that anything you toggle to OFF here won’t be able to send anything to your social networks until you toggle it back ON again.